Like many other curry recipes on the blog, Pakodi Ki Sabzi is too courtesy mom’s recipe book. But this one, in particular, she learnt from her bania (a business community in India) friend much later in life. A no onion/garlic eating regime is quite common in many Indian households but definitely not ours. We follow this kind of strict diet only during certain festivities or mourning, else we are very much in love with our onion and garlic masala. So this friend of mom’s is a pro in no onion/garlic cooking. There is a strong sulfur-rich aroma hanging in the air of her kitchen, maybe because she profoundly uses ghee, jeera and hing tadka for cooking most of the dishes. And we as a kid found that peculiar smell weirdly pleasant and tempting. So we were introduced to this Pakodi Ki Sabzi by this lady (mum’s friend). And much later, when I started exploring the intricacies of local food, found that Pakodi Ki Sabzi is quite a popular recipe in many parts of Northern India. 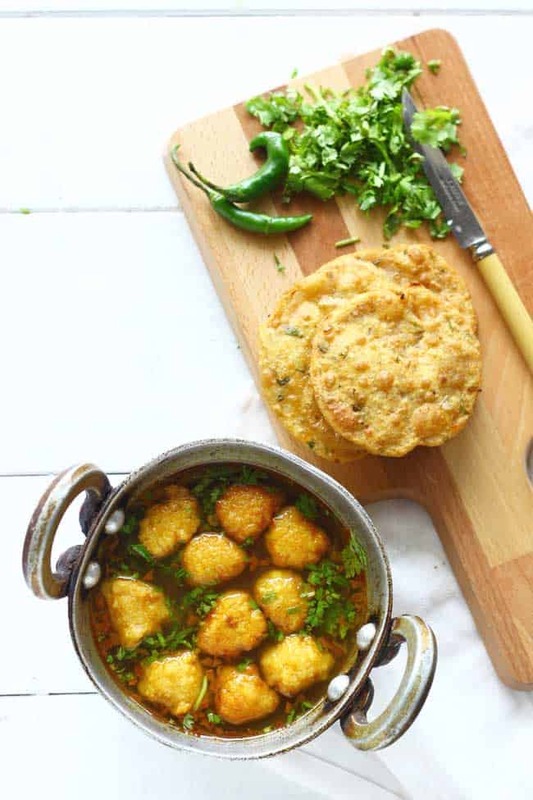 While we observe nine days of fast during the festival of Navratri and follow a frugal sattvic diet, recipes such as Pakodi Ki Sabzi, Aloo Paani, Dahi Lauki come really handy. One, they are fulfilling and wholesome, second, it requires few basic ingredients to prepare them. The hearty curries are scooped with poori and paratha along with raita. 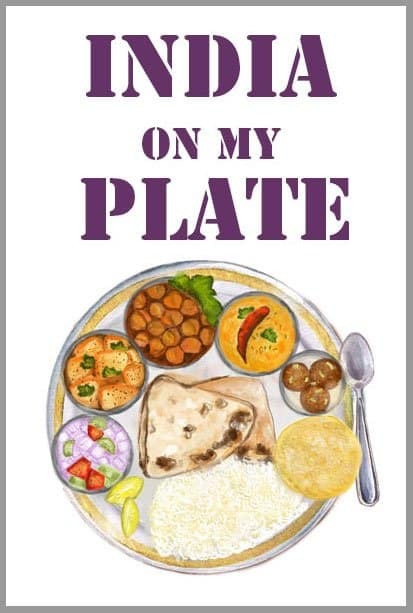 It is the popular combination in the family during the sacred Hindu months when, one is prohibited from consuming meat, egg or onion/garlic. There are rarely 30 odd days in total over the year when we confine ourselves to such diet. And for these days we need to plan the menu well in advance. The ladies of our family are not much accustomed to cooking without onion/garlic. So we specifically search for dishes, which taste does not depend much on the onion-garlic paste. 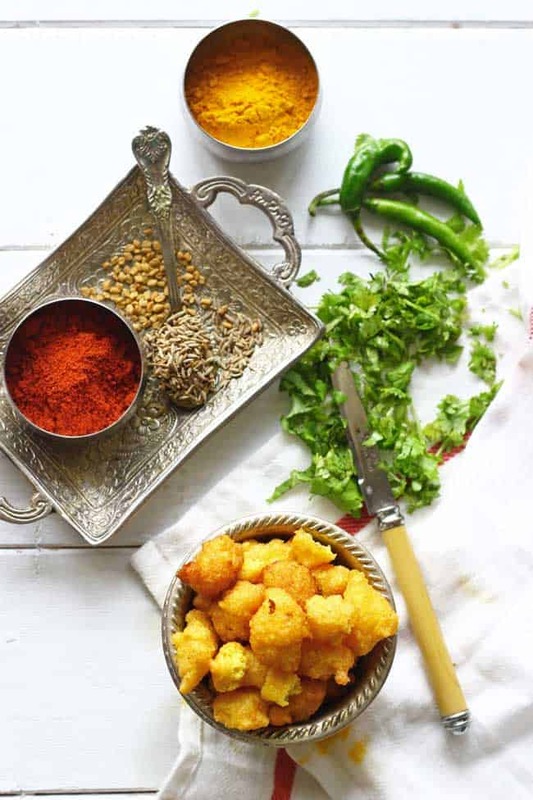 And Pakodi Ki Sabzi is one such recipe where the heart and soul of the dish is – asafoetida (hing). There is a profound flavor of asafoetida in this curry. And the chopped coriander leaves added towards the end provide a subtle fresh aroma to the sabzi. Even during the dull summer days, when there is a limited variety of vegetables available, Pakodi Ki Sabzi add a great variety to the menu. If you prefer, you can serve it with steamed rice as well. And there is an unsaid comfort in sampling this soupy curry while making a slurpy sound. 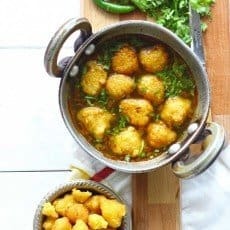 In many parts of the Uttar Pradesh, Pakodi Ki Sabzi is also known as Mangodi Ki Sabzi or Tazi Mangodi Ki Sabzi, these are different names of the same dish. Learn more about our everyday food and travel adventures on Instagram. In case you want to search for us on Instagram, look for @funfoodandfrolic. Pakodi Ki Sabzi adds a great variety to the no onion/garlic menu. If you prefer, you can serve it with steamed rice as well or with chapati and raita. Learn how to make mong dal wadi curry in few simple steps. To make the moong dal pakodi, wash and soak the moong dal in water for 4 - 5 hours. Next, drain the excess water and grind the dal along with hing to a smooth paste. Make sure not to add water while grinding the lentil. Transfer to a bowl and whisk the dal paste for 2 - 3 minutes using a spoon. Combine salt and spices in the lentil paste. Heat oil in a deep-frying pan over medium flame. Once the oil is hot enough, drop tiny grape size portion of lentil paste in the oil. Make sure there is enough space between each pakodi to turn. Maintain the heat at medium-high. Turn the fritters once crisp from one side. Transfer the moongodi to a plate lined with paper towel. Similarly, prepare the moong dal pakodi with the remaining batter. To make the curry, grind tomatoes to a coarse paste in food processor or blender. Heat ghee in a saucepan over medium flame. Add cumin and hing. Fry for a minute. Add grated ginger and stir. Fry till the raw smell of ginger wafts away and it turns light brown in color. Add tomato paste and green chili. Stir and fry over low heat till the paste starts leaving the sides of the pan. Add spices and cook for a minute or so. Now add 2 - 3 cups of water in the pan. The consistency of this curry is similar to Rasam so adjust the amount of water accordingly. Season with salt and bring the curry to a boil. Reduce the heat to low and allow the curry to simmer for 10 minutes. Stir occasionally in between. After 10 minutes, add moong dal pakodi in the curry. Simmer for 5 more minutes. Turn off the heat. Add chopped coriander leaves. Cover the pan with the lid and let the curry sit this way till ready to serve. 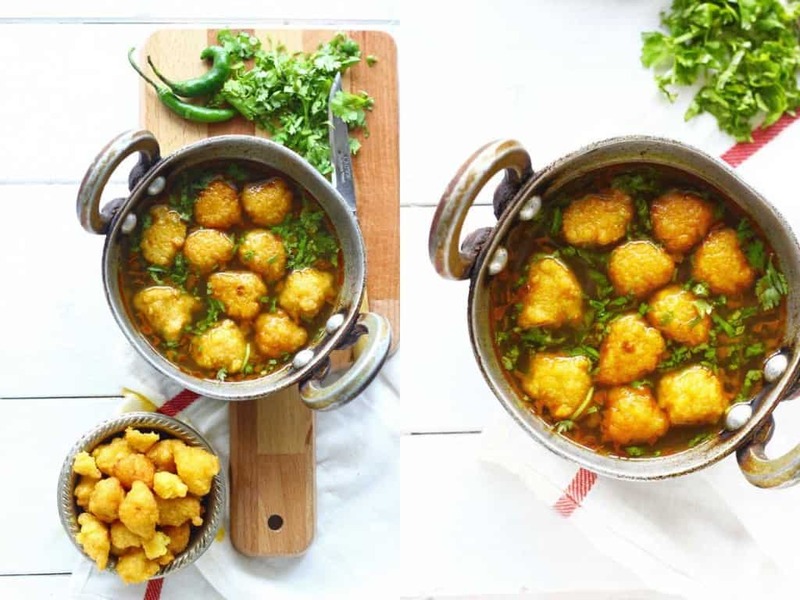 Serve Pakodi Ki Sabzi with Phulka for lunch/dinner. HI Hina, this is a unique recipe that I’ve come across. Normally, the curry recipes that I know are those that are thick and at one look you will know that it’s curry. But your curry soup has a clear base! looks like tom yam soup to me. Haha. I like the comparison. Yes, it is a light and soupy curry. Perfect to deal with hot Indian summer when robust curries are tough to digest.